I was recently given a 1964 CJ-5 (great gift), but it is somewhat of a basket case. 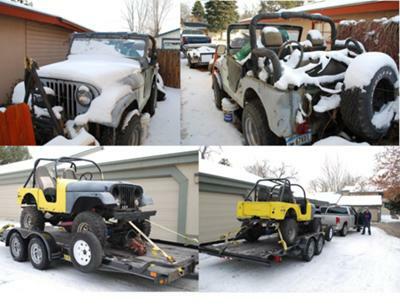 Then I also found a 1970 CJ-5 locally for $1,000.00. Both of the wonderful older Jeeps have their strong points, but alone they need just a little too much. So as the title states “Sometimes it Takes Two”. I have only brought them home so far, but here are a few photos of the two players in this “Merger”. Larry's Comment: Man...nobody ever gives me a Jeep...basket case or otherwise...ha! Mike that sounds like a pretty good "merger" in the making. Keep us up-to-date on the progress.